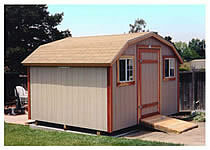 Welcome to californiacustomsheds.com - storage sheds, outdoor storage sheds, wood storage sheds, and cailfornia custom sheds. 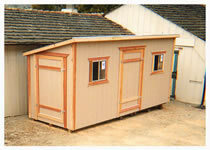 California Custom Sheds® serves Monterey - Santa Cruz - San Benito - Santa Clara Counties. Contact us for a free 16-page catalog or to find out more information. Highway 101 (El Camino Real North) and Ralph Lane. See Map. Thank you for your interest in our quality built Wood Storage Sheds. California Custom Sheds® has been a leader in the storage industry since 1984. Prior to the creation of California Custom Sheds®, more than 33 years ago, we built custom homes in Southern California. We have applied this knowledge and experience to our storage buildings. We have also accumulated an abundance of knowledge developing our buildings to perfection over the last 33 years. Some, by listening to suggestions and ideas from the thousands of customers whom we have had the privilege to serve. There are many shortcuts a company can take when building a wood storage shed and garden storage sheds. Inferior building materials, or lack of materials, are just a couple of examples. Many of these shortcuts are never noticed nor can be seen by the untrained eye. 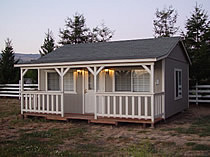 California Custom Sheds® does not take shortcuts and uses only the best quality materials available to construct the best buildings available at a reasonable price. 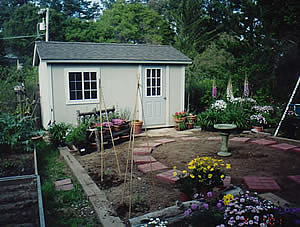 Let us know what you're using your California Custom Shed for, so we can help you create a shed to fit your needs. Our customers have used our buildings for more than just your ordinary backyard garden storage shed. 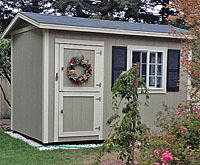 Many have customized our storage sheds for potting sheds, tack rooms, hobby & train rooms. 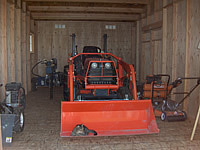 Some have used our buildings for motorcycles, golf carts, or riding lawn mowers. (One customer even parked a 1956 Cadillac in one of our sheds!) Others have used our sheds for a paint studio, guard shacks, offices, a dry shelter for a favorite pet, firewood storage, well pump house, or a ticket booth. 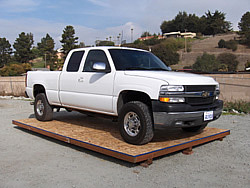 Whatever your needs may be, visit us at our display lot located between Salinas and Prunedale on HWY. 101 (El Camino Real North) & Ralph Lane, and we will be happy to help you customize a building to fullfill your needs. We have over 30 buildings on display, which will show you the quality of our storage sheds, and give you many ideas you can apply towards your own building. California Custom Sheds® is family owned & operated, and has over 34 years of satisfied customers who have become our friends and neighbors. We will do all we can to make your experience with us an enjoyable one. We take great pride in our work, and our top priority is to make sure you're satisfied with our wood storage sheds and our service. Call for a free 16 page catalog. WE PRIDE OURSELVES ON QUALITY and SERVICE!!! Southern California residents check out Shed World at www.ShedWorld.com. MOST SHEDS ARE BUILT ON SITE IN ONE DAY!